Once the capital of Kakatiya Kingdom the historical city of Warangal presents an ideal holidaying opportunity to everyone. 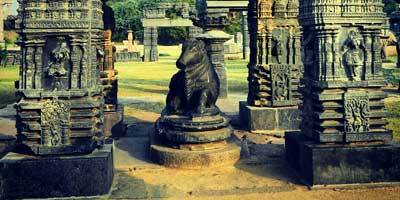 Plan a Warangal Tour and spend a few days amid the architectural splendor of bygone eras. Warangal is bestowed with rich wildlife and admirable scenic beauty as well. Once in this city, you can spend your days exploring a wide range of interesting Warangal tourist places. We have listed the top places to visit in Warangal. Laknavaram Lake is undeniably one of most popular visiting places in Warangal. Spread across 10,000 acres of area, this lake was first discovered by the Kakatiya rulers who then built a sluice over the lake to make it as water reservoir. This lake serves as a source of irrigational water for 6 villages, comprising of around 3,500 acres of land. A visit to Laknavaram Lake offers you breathtaking scenic beauty. Its vast spread of serene water, surrounded by lush greenery creates a scene worth remembering. Sunset here is especially mesmerizing. Facility of boating is also offered at the lake. Haritha Hotel Laknavaram by the TSTDC offers good accommodation facility as well. A 160 meters long suspension bridge over the lake is another attraction of Laknavaram Lake. Walking through the bride with the vast spread of water around you and refreshing greenery of nearby hill is sure to leave you enchanted. The most popular place to visit in Warangal is the Thousand Pillars Temple, located at the base of Hanamkonda hill. It was built in 12th century by the Kakatiya King Rudra Deva. Dedicated primarily to Lord Shiva, this temple is also known by the name of Sri Rudreshwara Swamy Temple. At this temple, three deities- Lord Shiva, Lord Vishnu and Lord Surya are worshipped. They are known as Trikutalayam. There are three shrines, one for each deity. Currently under the maintenance of Archaeological Survey of India, Thousand Pillar Temple is known for intricately carved pillars. 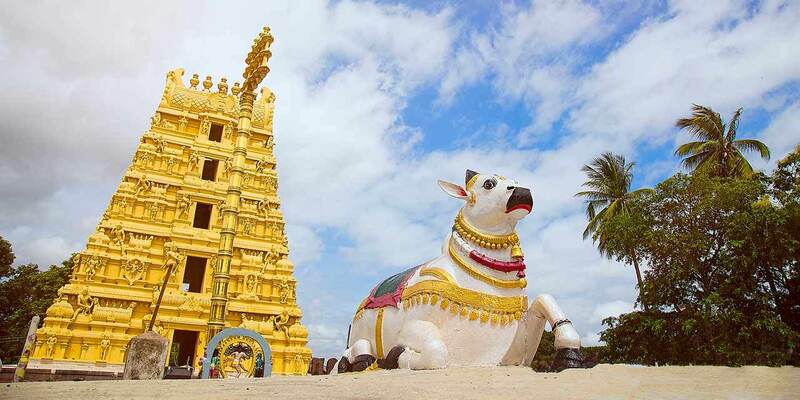 A massive sculpture of Nandi, carved out of a single rock, is another attraction of this temple. Rock cut elephants and exquisite engravings at the temple are also worth noticing. Located around 77 km away from Warangal city, Ramalingeswara Temple was built in 1213 AD during the Kakatiya rule. It is dedicated to Lord Rama Lingeswara, it was constructed by King Ganapati Deva. Also known as Ramappa Temple it is named after its sculptor Ramappa. Ramappa Temple is under the maintenance archaeological Survey of India. Along with its historical significance this holy shrine is known for the bricks that were used in building this temple. These bricks are so light that they can even float in water. Pillar of Ramappa Temple are another attraction; each pillar of the temple represents a mythological story. These pillars are also said to produce musical sounds when hit. Another thing to notice in this temple is the massive sculpture of Nandi that is shown in attentive posture. Built in 13th century, Warangal Fort is a perfect example of architectural fineness of Kakatiya reign. Warangal fort was built by the King Ganapati Deva and was later developed further by his daughter Rani Rudrama Devi. Later additions to this fort were also made by King Prataparudra II, also known as Rudradeva II, who was the last ruler of Kakatiya Kingdom. This fort was built when the Kakatiya kingdom was relocated from Hanamkonda to Warangal. Warangal fort has three layered circular fortification, each offering a robust defense. However, due to various attacks, Warangal was damaged to a great extent. Ruins of the fort can be mostly in its middle part. Recognized as an archaeological zone, this fort is a place for every tourist who wants to get an idea of the glorious past of Warangal city. An ancient temple, Bhadrakali temple is located between Warangal and Hanamkonda. Dedicated to Goddess Bhadrakali, this temple dates back to Chalukyan rule. However, this temple regained its glory in 1950s when Sri Ganapathi Sasthri along with other locals started renovations of this temple. During renovation changes were made to the main idol as well. It is said that the deity was in fierce form, which was later changed to more subtle and calming idol. The main deity Goddess Bhadrakali is in a sitting position here. She is shown with 8 eight hands, each with one weapon. 2.7 meters long, stone idol of the deity is wearing a crown as well. A popular visiting place in Warangal, this temple attracts lakhs of devotees throughout the year. When visiting this temple also plan a visit the Bhadrakali Lake and the natural rock formations which are located closer by. Khush Mahal is a popular place to see in Warangal, presenting a glimpse of architectural style during Tughluq reign. Standing closer to the Warangal fort, Khush Mahal is an audience hall which was built around 14th century at the time of Tughlaq rule. It was later used by Shitab Khan who was Qutub Shahi Dynasty Governor of Warangal in 16th century. Khush Mahal is consisted of a huge chamber with arch opening on four sides with slanting walls. This sturdy looking structure has withstood the ravages of many decades, presenting an impressive architecture. A manmade lake, Pakhal Lake was built around 1213 AD during the Kakatiya reign by King Ganapati Deva. It was built for the irrigational purposes. Spread across 30 sq km, this lake is surrounded by the refreshing greenery of dense forest. Adding to its beauty is the Pakhal Wildlife Sanctuary which is just next to the lake. One can see deer roaming freely in the surrounding as well as other animals such as jackals, wolf, panthers, sloth bear, tigers, porcupines, etc. The wildlife sanctuary also houses a wide variety of reptiles. For those looking for a peaceful environment should visit this lake. Tranquil surroundings accompanied by the rich flora and fauna promises an experience worth remembering. The view of sunset from all this lake is something that you cannot miss when visiting the lake. This lake is around 54 km away from Warangal. At a distance of around 100 km from Warangal, Eturnagaram Wildlife Sanctuary, located on the banks of River Godavari is one of the popular tourist places in Warangal. One of the oldest wildlife sanctuaries in the state, it was declared a sanctuary in the year of 1952. Covered by a dense forest, it boasts of rich flora and fauna. It is home to wild animals such as tigers, sloth bears, leopards, nilgai, blackbuck, deer, etc. Another tourist places to visit in Warangal is Sammakka Saralamma Temple. Built in 12th century, this ancient temple is dedicated to Goddesses Sammakka, who is said to have protected and fought for her tribe against Kakatiya rulers. She is believed to still protect her devotees. Festival named Sammakka Saralamma Jatara also known as Medaram Jatara is celebrated with great fervor at this temple. Lakhs of devotees from all over the state participate in it. Another place to visit in Warangal is the Kakatiya Rock Garden. It is located around 5 km from Warangal fort and about 2 km away from Warangal railway station. This garden presents an interesting display of rock sculptures of various wild animals such as lions, deer, giraffes, etc. Beautifully arranged flowers and plants along with an artificial waterfall make add scenic beauty to this park. This is also a manmade lake inside Kakatiya rock garden offering boating facility. Tourists can visit this carefully laid out park and spend some a few relaxed moments. Located near the Bhadrakali Temple which is another popular Warangal tourist place is the Kakatiya Musical Garden. It is around 2 km from Warangal railway station. This garden is spread over an area of 15 acres. Major attraction of Kakatiya Musical garden is the musical fountain presenting a coordinated show of light and music. It is operated via computers. In the background, a massive rock formation adds further to overall beauty of the musical garden. There is an artificial lake in the garden where the facilities of the boating are also offered. Located near the Ramappa Temple, Ramappa Lake is another place to visit in Warangal. Built during the Kakatiya reign in the 13th century, this lake is spread over an area of 82 sq. km. Surrounded by lush green hills, this lake is sure to allure you with its picturesque beauty. Popular as picnic spot, this place is idea to spend some time amid the peaceful surroundings of the lake. Boating facility, offered here make the visit to Ramappa Lake even more enjoyable. Many people can be seen taking a leisure walk as well. Located at a distance of 60 km from Warangal, Ghanpur Group of Temples is a popular place to visit near Warangal. It is complex f double stone wall, consisting of around 22 temples, each with a different size and shape. Also known as Kota Gullu, Ghanpur Group of Temples was constructed in 13th century during Kakatiya rule. These temples have architectural similarity with the Ramappa temple. The main attraction Ghanpur Group of Temples is the Lord Shiva temple. This temple has Sabhamandapa entrances, two 'Madanikas' or 'Salabhanjikas', offering a captivating sight. Ghanpur Group of Temples consists of various unique sculptures in addition to the exquisite carvings of flowers and mythological stories on granite rocks, walls and ceilings. Tourists can see figurines such as that of Gaja-Kesari-half human and half lion riding on an elephant and Hayagriva, etc. Presenting a unique sightseeing choice, Warangal Planetarium is a place to visit if you are looking for something entertaining yet educational for your children. Built with the motive of generating awareness on science related topics such as astronomy, Warangal Planetarium does promote scientific thinking among its viewers. It presents an interesting way to understand universe and its various aspects. Regular shows are conducted at the planetarium which interests not only kids but adults as well. Built during Kakatiya reign in 12th century, Padmakshi Temple is one among the oldest temples in Hanamkonda. Dedicated to Goddess Padmakshi, also known as Padmakshamma, this temple is especially visited by women devotees during the Bathukamma festival. The major attraction of this temple is the pillar Annakonda. Annakonda Pillar is made up of granite and is built in quadrangular shape. The walls of the pillar showcase carvings and inscription related to Jain religion, especially dedicated to Goddess Kalalaya. It is sad that Kakatiya rulers previously followed Jainism before converting to Veerashaivism. This is said to be the reason why Padmakshi Temple still holds traces of Jain religion. Situated in Hanamkonda, Vana Vigyan Park is serene park, which was built by the Forest Department. Spread across 50 acres of area, this park consists of a rich flora and fauna. Tourists can spot birds such as peacocks, pigeons, ducks, doves, etc. Along with a rich avian fauna, Vana Vigyan Park also boasts of a rich wildlife. It is home to animals such as Nilgai or blue bull, Sambar, spotted deer, sloth bear, rabbits, and reptiles like crocodiles, etc. There is well stocked library too within the park compound along with a museum and an auditorium that hosts various shows on environment. On the top of a hill, Regional Science Center is located in Hanamkonda, presenting an engaging and educational way of spending time. It was built with the assistance from National Council of Science Museums in Kolkata. Regional Science Center is gaining immense popularity among students. This center consists of around 84 exhibits describing concepts of Biology, Physics, Chemistry, etc. It has many interesting displays that impress not only kids but adults too. Musical corridor, sympathetic swing, pinhole camera, parabolic reflectors, infinite train are a few other attractions here. Leon Foucault pendulum explaining the Earth’s revolution and Magic tap which explain the concept of optical illusion where water falls without any pipe are also quite interesting to watch.